Sarens (the member of the RAWI) is not the first time working at a site near Navahrudak in the Republic of Belarus. 2 years later, in March 2019, Vestas again called on Sarens to use the crane for servicing the wind turbine. The key factor was the ability to mobilize machinery as soon as possible. To perform these works, vehicle-mounted crane (with a loading capacity of 600 tons) with a TEREX DEMAG TC2800-1 truss-type boom was used. Its main boom is 126 meters long and it also has a LF2 gooseneck extension (fly jib) with a length of 12 m, a main counterwieght of 160 tons and a superlift counterweight of 130 tons. This configuration is widely used worldwide for the installation of wind turbines, but in the CIS-countires is almost absent. It allows significantly faster redeployment with complete disassembly between sites in compare with utilizing the crane equipped with a standard fly jib. The main problem faced by the Sarens team was the confined nature on the site and the condition of the soil after the winter which made them to resort to using plates. For the assembly of the crane with a capacity of 600 tons, the crane with a capacity of 130 tons was utilized. During the assembly process, it was necessary to constantly relocate the auxiliary crane to move the boom section for further assembly. Due to the difficult conditions on the site, the complete assembly of the crane was delayed by almost 4 days. 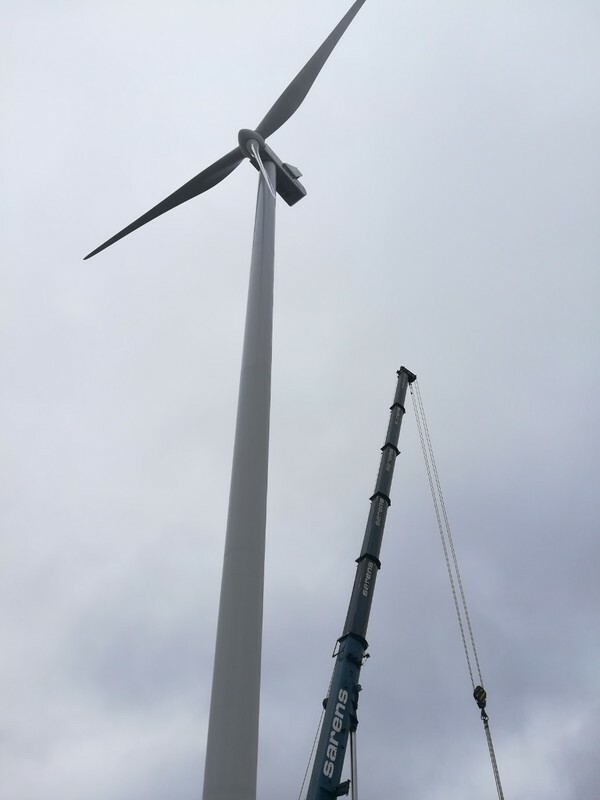 The generator was lifted in 1 day, and the professional work of the Sarens team and, in particular, the crane operator, was independently noted by both the client and Vestas staff. The highest wind turbine in Belarus continues to generate green energy!